A very showy species in cultivation, producing many flowers. Pinching stem tips in spring will promote compact shape. Q: Is this aster suitable for growing in a pot? If so, what size pot? Are there other asters suitable for container growing? 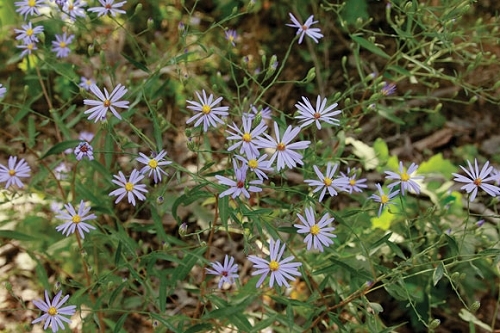 A: This aster, along with several others, may get a little leggy for a container. You can keep asters looking tidier if you prune them severely several times a year. In May or June, you could trim the plant at the point just above the lowest or second-lowest set of leaves on the stem. This will cause the plant to grow several more stems from the point where you snipped it. In a month or so, when the new stems have grown quite a bit, you can trim the new stems much as you did the original stem. 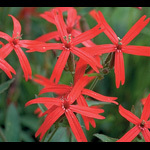 This treatment should cause the plant to produce more flowers and look a bit more formal. You should use a container that is roughly gallon-sized. We grew smooth aster in 2-gallon containers this year, and they performed well. Aromatic aster might be a better choice. Treated as described above, aromatic aster could end up looking like a sky blue mum.